I hope everyone is well and warm or - if you're in the Southern Hemisphere - comfortably cool this Advent season. We've been busy (ha! When are we ever not?) but not all because of Christmas. This weekend, for instance, we're hosting Jenna's birthday party with a few neighbors and school friends. As a result of so much partying and Bunnymaking, I'm a bit behind on Christmas prep. Happily, this week I get to clean up my sewing room and think about gifts, cookies, baking in general and all the things I love about preparing for Christmas. I feel like in the rush of . . . well, everything, I've missed simply being present here with you guys, so let's do a quick random update, shall we? This has been a good year. Although also in many ways a very weird year, because we remodeled the house and the first half of the year was a bit nuts and then I was playing mega catch up after the summer. Workwise, it felt like I was madly scrabbling some days and other days in complete stasis. It'll be fun to do a roundup at the end of December (assuming I get my act together) and see how much I actually got done - or not - in those 6 months! We're settling into a new church and I get to coordinate crafting activities with kids from preschool up through elementary school in various programs, which has been wonderful and has made me feel productive in many different ways than before. I used to be maniacal about running but that has recently stabilized to something more normal - I've made myself be okay with sometimes jogging on the treadmill instead of pining to be outside on even the hellishly humid days, or pollen-nightmare days or those frigid days that scream Hypothermia. I'm also reacquainting myself with the piano. I took lessons till I was 12 and while I've played chords and stuff since, I'm shockingly rusty and it still takes me forever to read a proper score because while my hands work decently separately, they are a bit of a disaster together. It's been fun rediscovering that somewhere alongside rock ballads and hiphop and the other, noisier genres I naturally gravitate toward, there is a secret part of my soul that craves Bach and (current obsession) Purcell. The girls are growing older and taller faster than I'd like! They love school and are enjoying flute and piano and trombone and ukelele and recorder and swimming and Minecraft and reading and baking and writing. 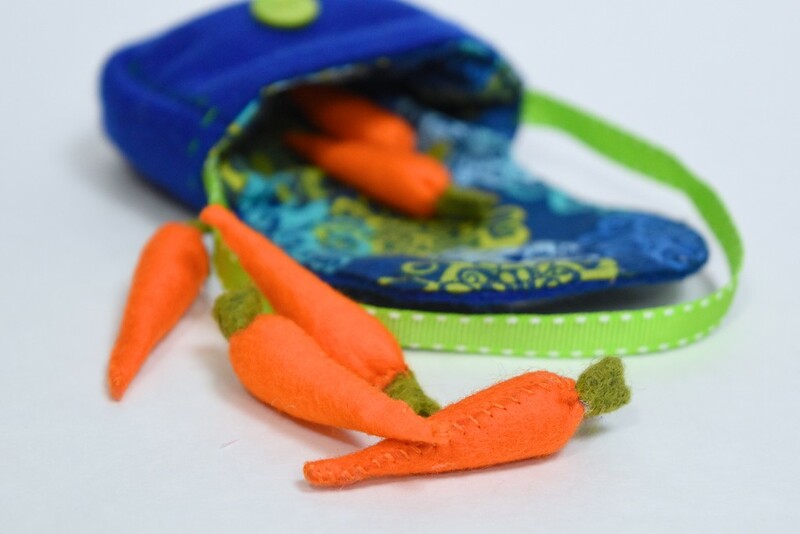 In the summer, they dabbled in the commercial aspect of crafting and sold some items in my Etsy store, in the process learning about marketing and the value of handmade. It's been interesting to watch them set their own goals, work hard and prioritize how to use their profits: Christmas gifts? New musical instrument? Art markers? So many choices, and so gratifying to know it's the result of the work of their own hands. Now that they're older and more independent, motherhood looks different, too. The kids are doing laundry, baking treats with me completely hands-off, packing their own lunches, planning their own Christmas gifts, organizing their own social activities, initiating their own creative pursuits. We're trying to do some experiential things for birthdays instead of physical gifts, like concerts-with-mom instead of books they may not want to read or craft supplies they already have too much of. They're challenging themselves in school and after-school activities: auditioning, volunteering, trying very hard to work with a tough sports schedule before deciding to let go. Different things are important to them now. Friendships, for instance, are no longer about getting together for playdates with favorite classmates - they're more about connection and accountability and being sensitive to feelings (which now have more nuanced names than Bad, Mad, Sad and Glad). I like that. I think that I have more time for myself and my work now. Some days it feels like because the kids are occupied in school I should be chillaxing on the couch with a fun novel, but I'm finding myself in the kitchen instead because, as the kids get more discerning in their tastes, I want to prepare more interesting meals. My day looks different, too: I'm trying to get more structure in it - often the challenge when one is self-employed and works at home - and being more organized so I'm not running ad-hoc mini-errands 7 days a week. Creatively, I feel like I'm in an introverted phase. 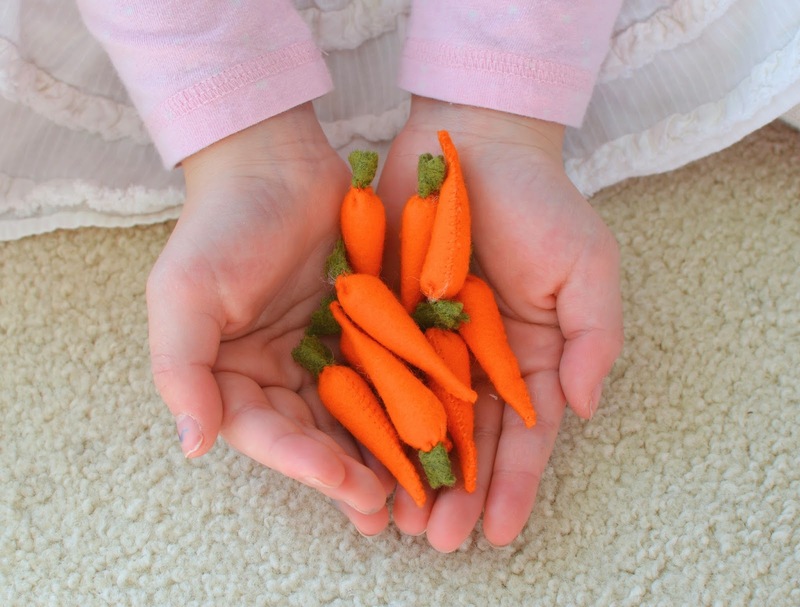 When they were little, I'd watch my girls play and respond in extraverted ways: table tents and toy sets and wooden dolls and felt food and crazy dress-up clothes. Explosive, dynamic, blow-your-mind fun, yes, but the inspiration was all-consuming, often leaving no mental room for other kinds of artistic stimuli. Now I'm more about process - the how much more than the what. Still creating, still designing, and (if I'm honest) still a little bit bonkers but I'm no longer breathless. And out of that new creative space have come a solidification of those hows - tutorials and deconstructions of method and foundational principles - as well as other kinds of whats: music and fiction - and food! It's a good place to be. Enough of me! 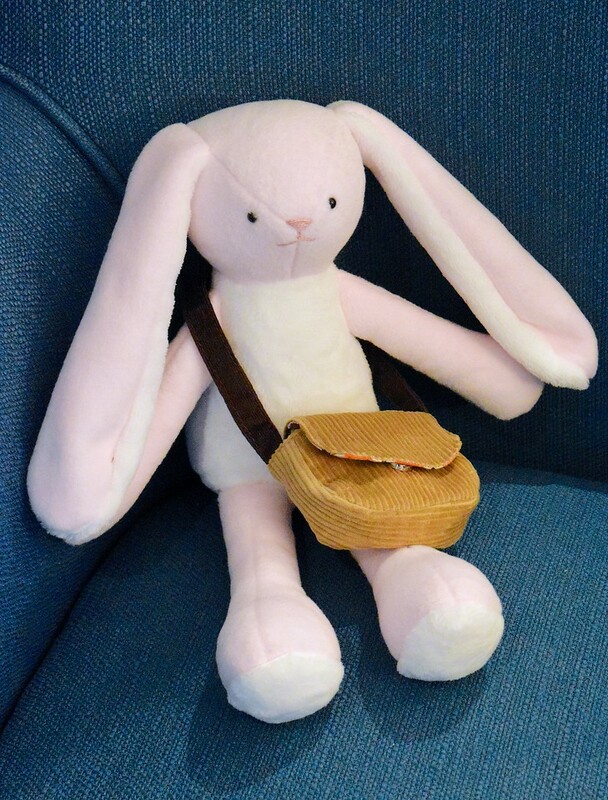 Let's move on to the point of this post - a bag for a bunny! It's tiny: just 3" wide and 2.5" tall and about an inch deep. 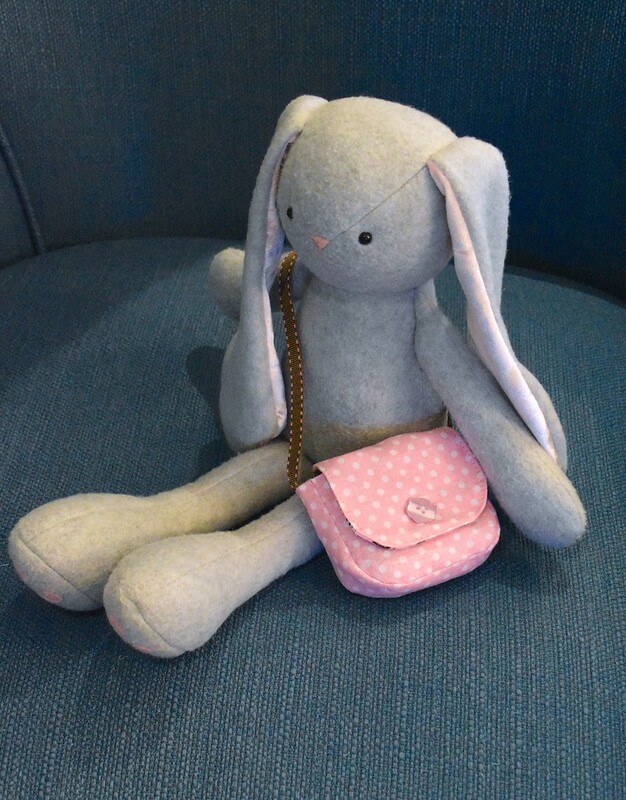 It's a really simple design so you can jazz it up with fun fabrics, funky trim straps, saddle-stitching, embroidery, buttons . . . go crazy! 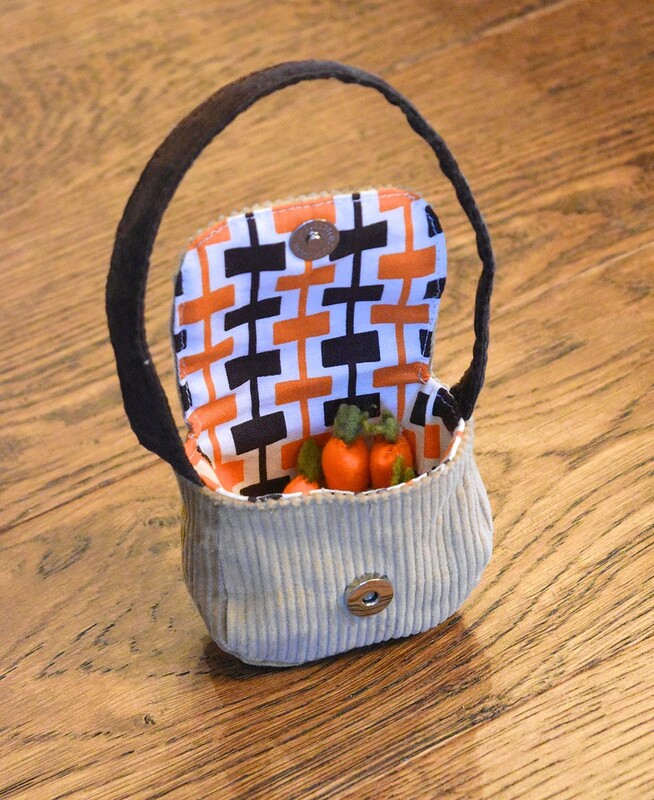 You're snickering in disbelief, but I promise: some curved seams aside, this is a really simple bag to make! You can download the templates below - click on the link below the picture and print out to 100% - that 1" calibration square will help you. 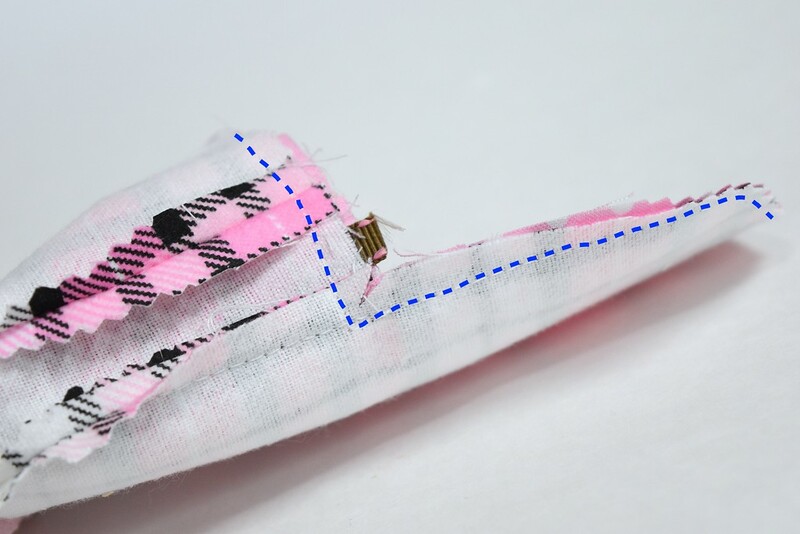 NOTE: There are no seam allowances, so you'll need to add your own. I recommend 1/4" SA around all sides. 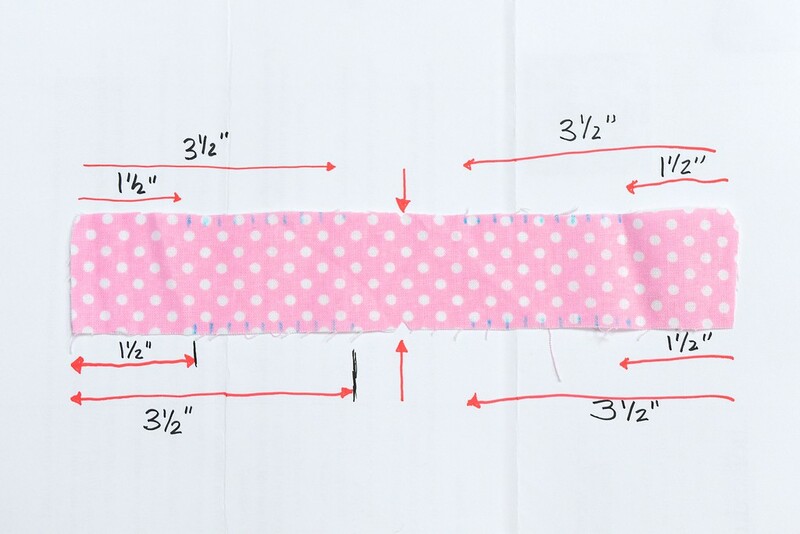 Regarding yardage: it's hard to estimate because it's so little fabric. I'd say 1/8 yard, maybe? 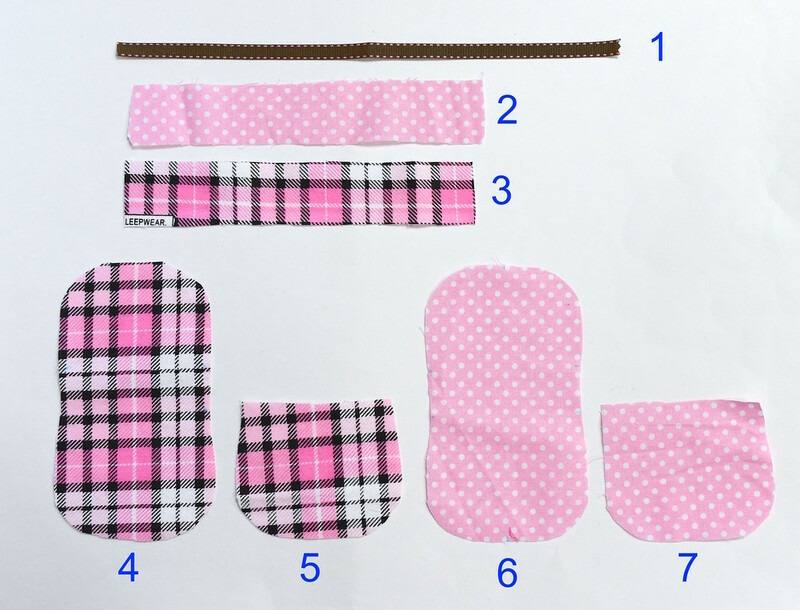 You'll need one fabric for the outer layer and a second one for the inner/lining layer. 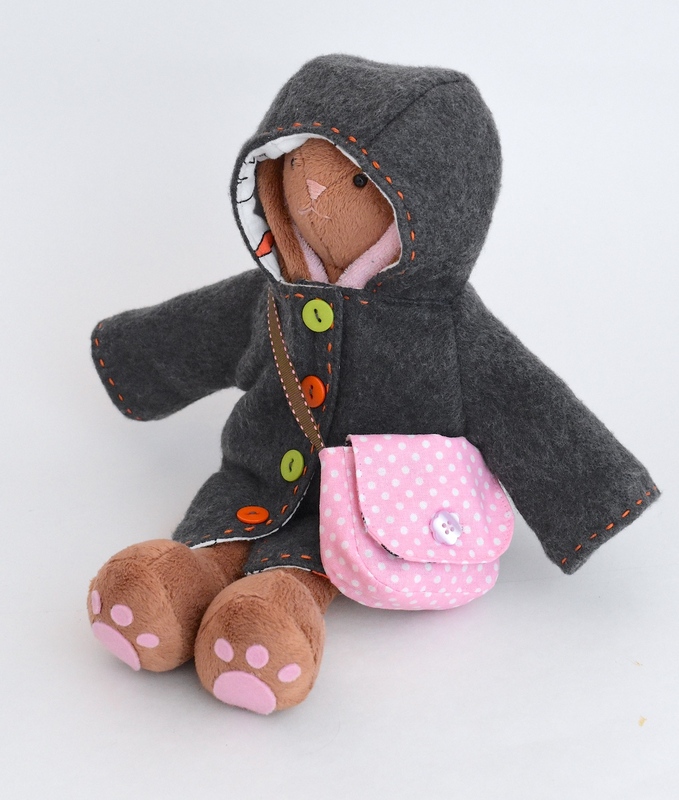 Good options include flannel, quilting cotton, wool, babywale or medium-wale corduroy, really thin leather, etc. 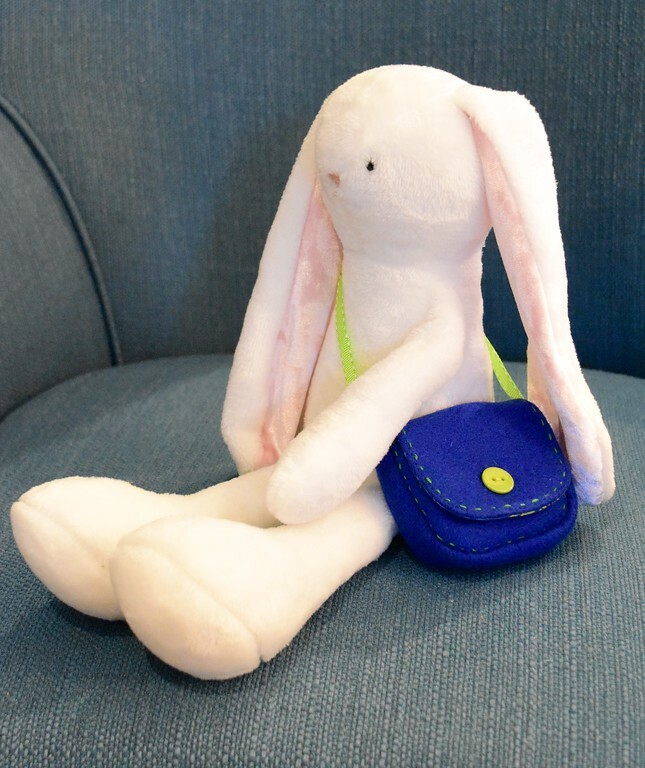 I wouldn't use fleece, felt, twill, duck cloth or anything heavy-weight or bulky. 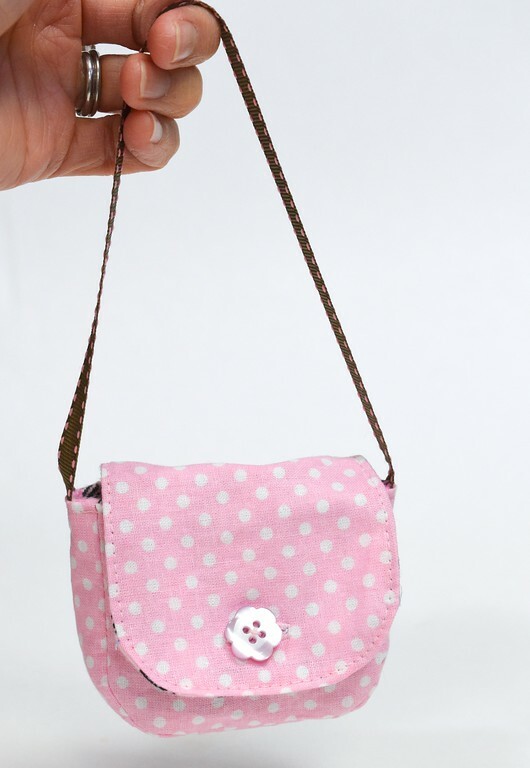 I also didn't bother with interfacing - it's such a tiny bag that it holds its shape even without. STRAP - I used a 3/8" to 1/2" wide trim, 12" long (including 1/4" end allowances for sewing). 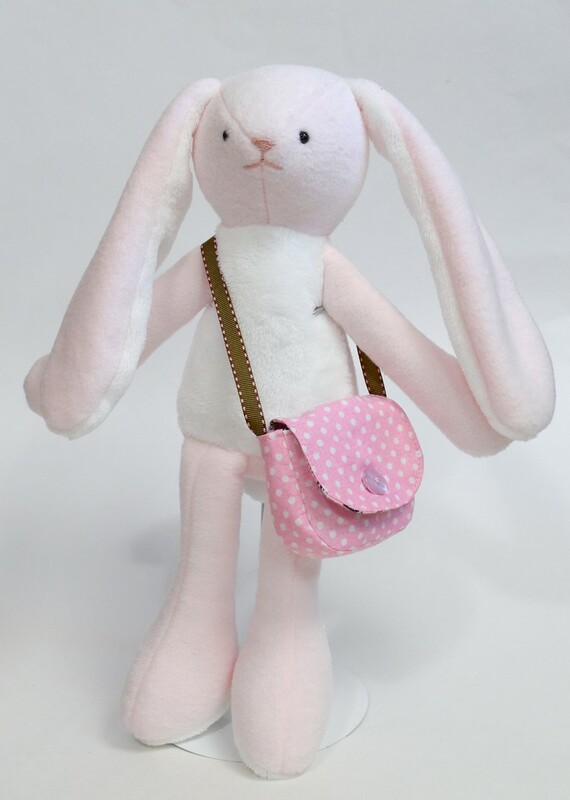 This length is perfect for wearing cross-body without the bunny coat. 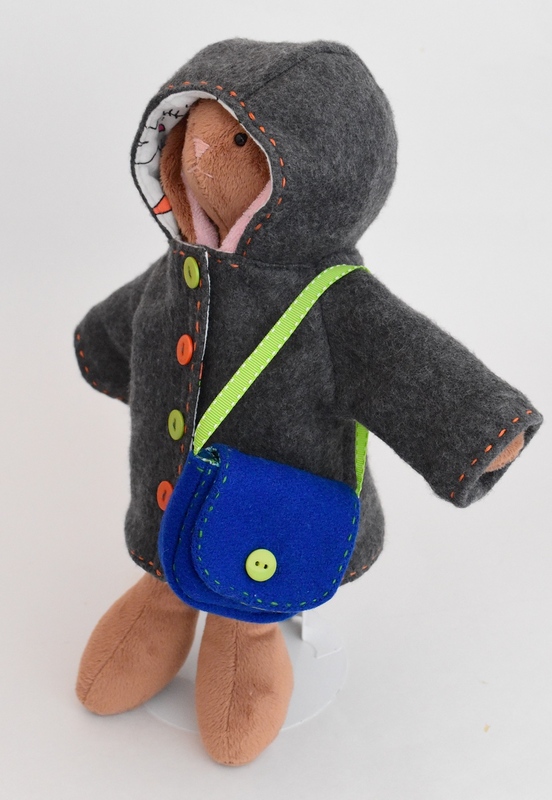 With the extra bulk of the coat, you might want a longer strap - try 14" including end allowances. 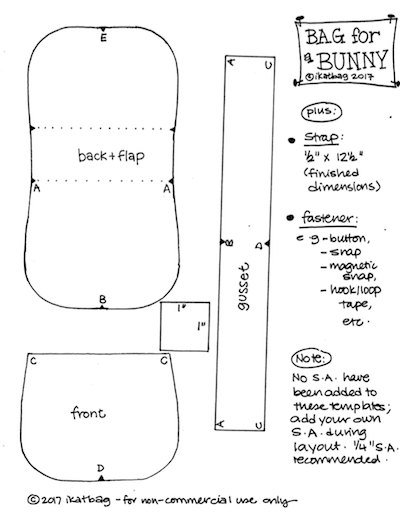 If you want to make your own strap, try this tutorial for an open-ended strap. 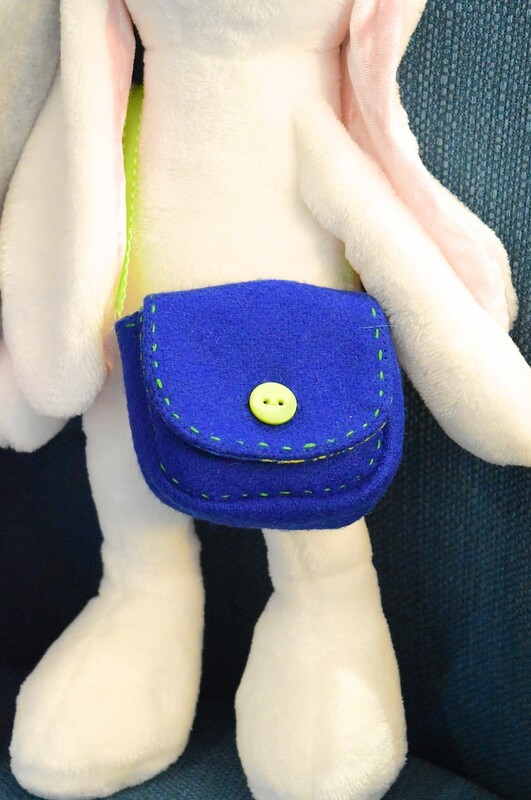 Plus a button, magnetic snap, hook-and-loop tape or whatever fastener you want. 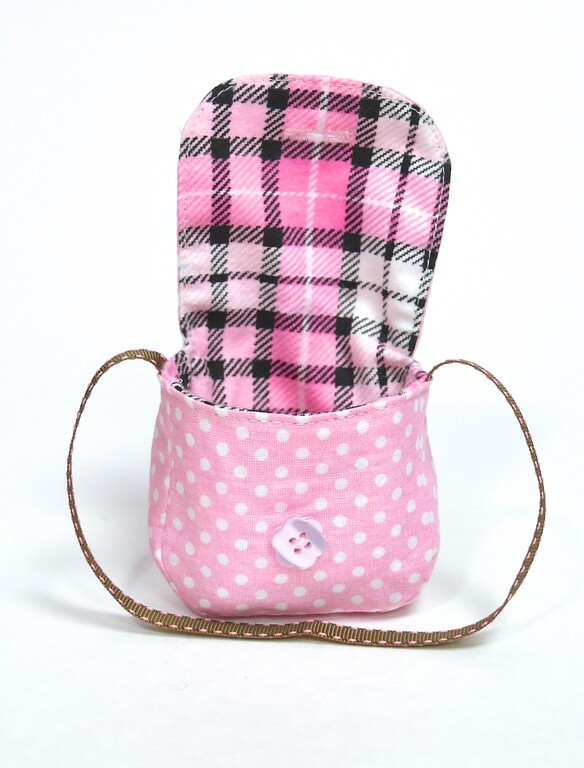 Or omit a fastener altogether - the flap naturally keeps the bag opening shut. 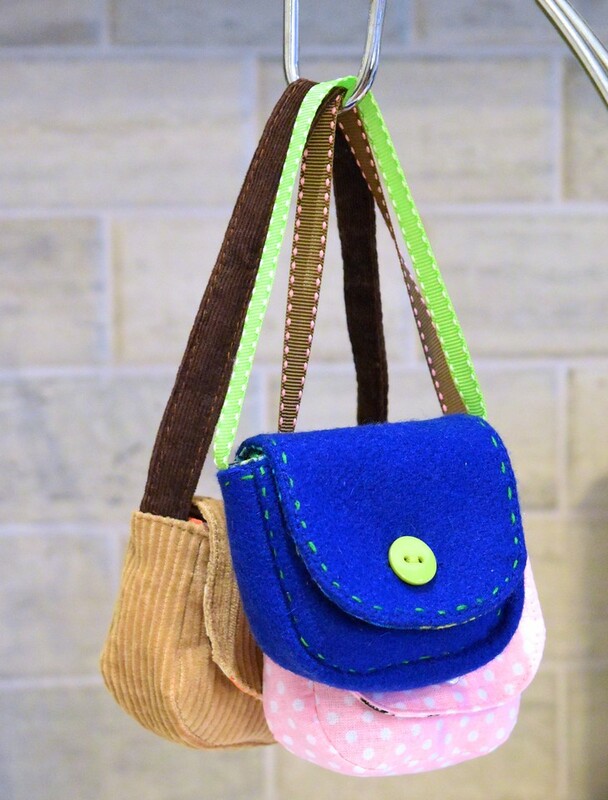 I'm using the same method that I used in this earlier messenger bag/satchel tutorial, so if the following pictures are hard to follow because the bag is so tiny, you can go back to that older post to see the same process in a bigger bag. Mark the midpoints B and D on the outer gusset. From one corner of the gusset, measure and make two marks mark 1.5" and 3.5" along the long side. Between those marks, snip partway through the SA (those tiny light blue lines). Repeat from the other three corners. 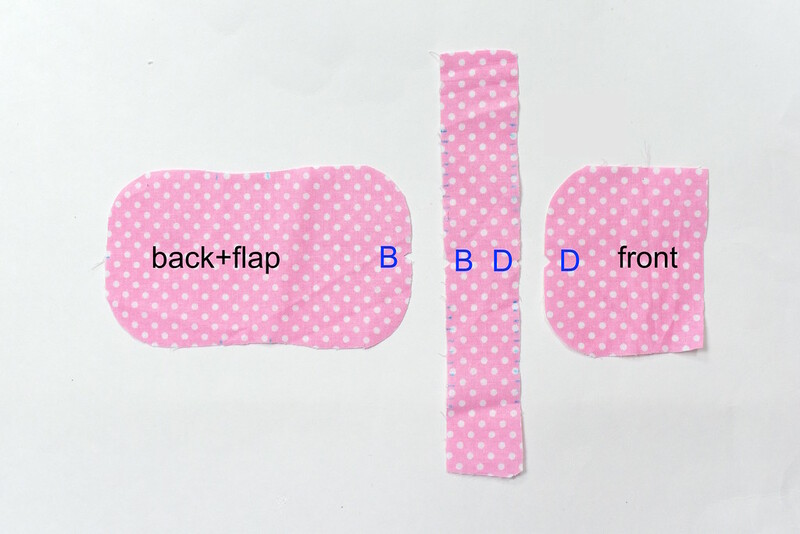 We will be matching up the midpoints of the outer gusset with the corresponding midpoints of the outer back+flap and outer front pieces. First work with the outer gusset and the outer back+flap piece. With RS together, match up the midpoints B of both pieces. 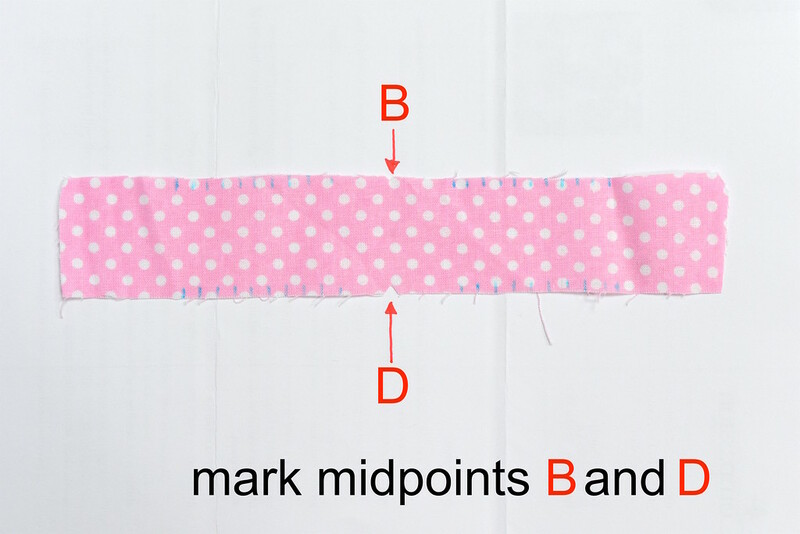 Also match up the end points A (not the corner/short edge of the fabric) of the gusset with points A of the back piece. Pin in place, curving the gusset around the back piece as shown. Sew from the edge of the fabric at one point A around the gusset to the other point A to attach the gusset to the back piece. 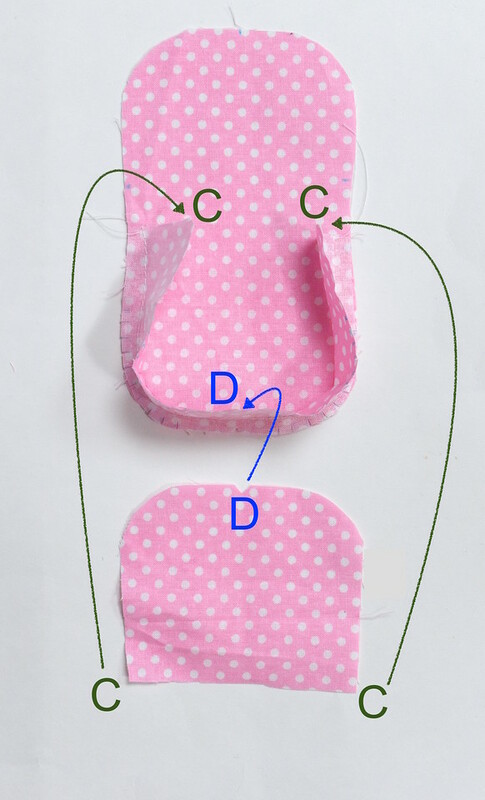 The little snips you made in the SA of the gusset will allow it to fan out around the curved corners of the back piece. the end points C of the gusset match up with points C of the front piece. 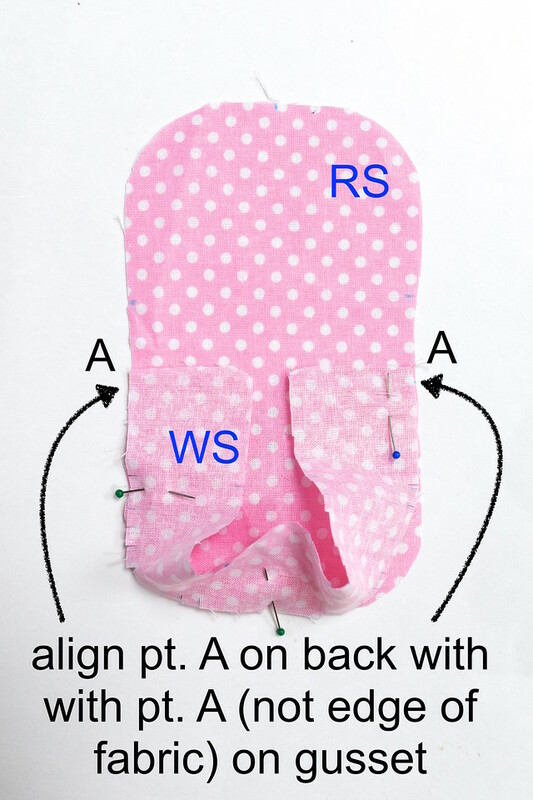 Clip or pin in place and sew around the gusset from one point C to the other point C to attach the gusset to the front piece. 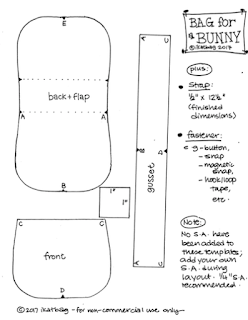 It is easiest to work with the front piece underneath and the gusset (and now-attached back+flap piece) on top. Here is the finished outer bag layer at this point. Press open all seams. Repeat Stages 1 - 3 to make the bag lining layer. 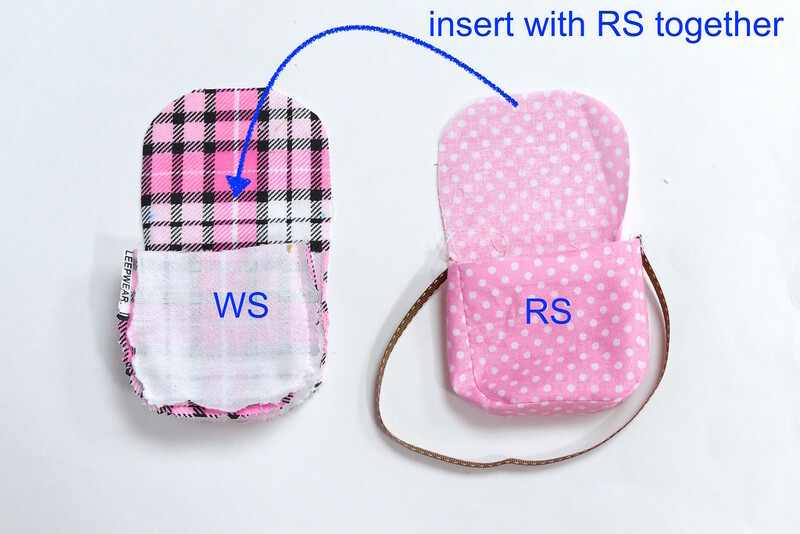 With the outer bag turned RS out, sew one end of the strap to the SA of one short side of the gusset. 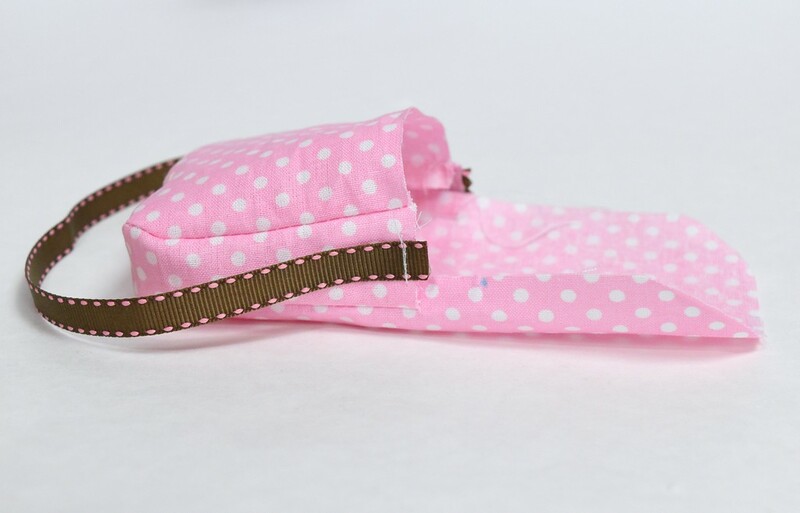 Wrap the strap around the bottom of the bag as shown and sew the other end of the strap to the SA of the other short side of the gusset. 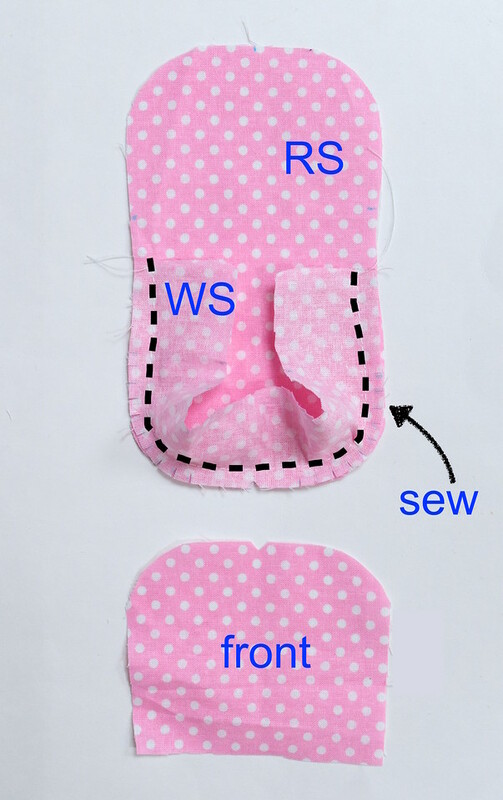 all sides are aligned, including the edges of the flaps, the short ends of the gusset and the straight edges of the front pieces. 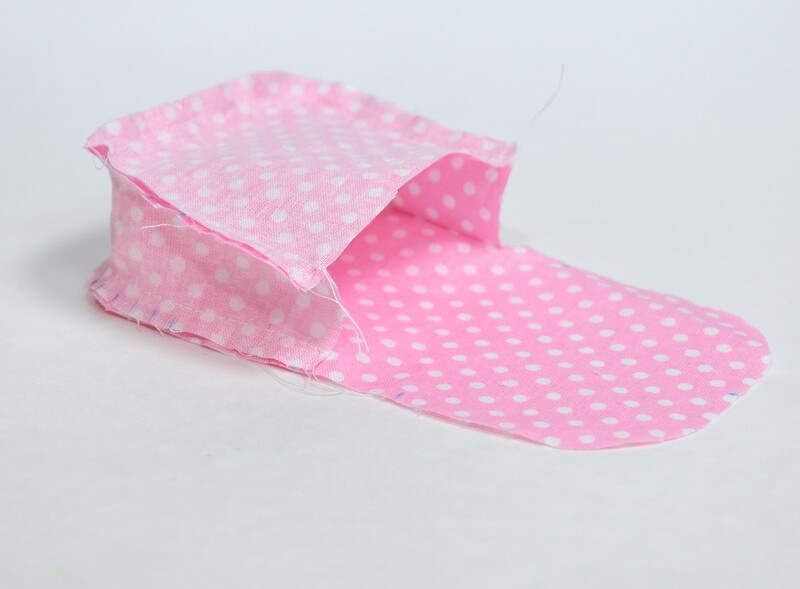 If you are using magnetic snaps or hook-and-loop tape that should be installed while the layers are separate, install them now before sewing the layers together. 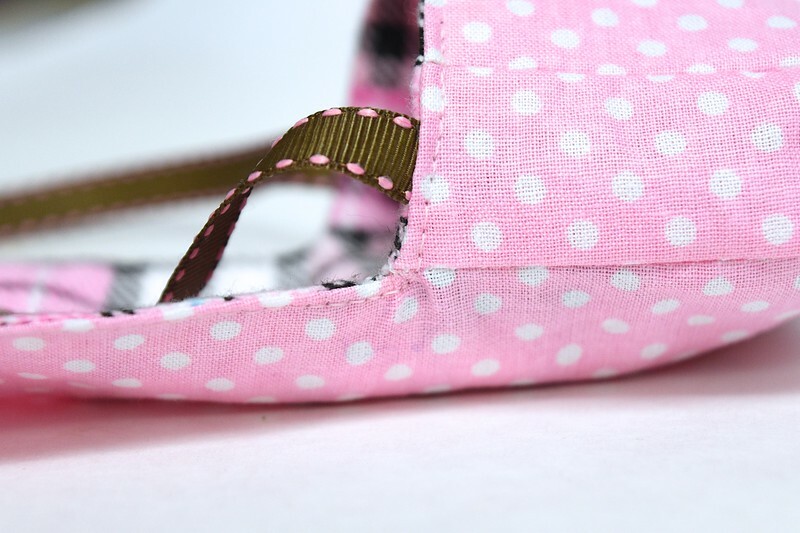 Otherwise, sew around the remaining open edges of the bag to join the two layers together. Leave an opening of about 1" to 1.5" anywhere along this seam (I suggest the straight edge of the front piece) for turning out the bag later. Here is another view of the seam: it goes all around the flap, turns the corner at A, continues through C around the front piece to the other point C, turns the corner again at the other A and completes the loop. 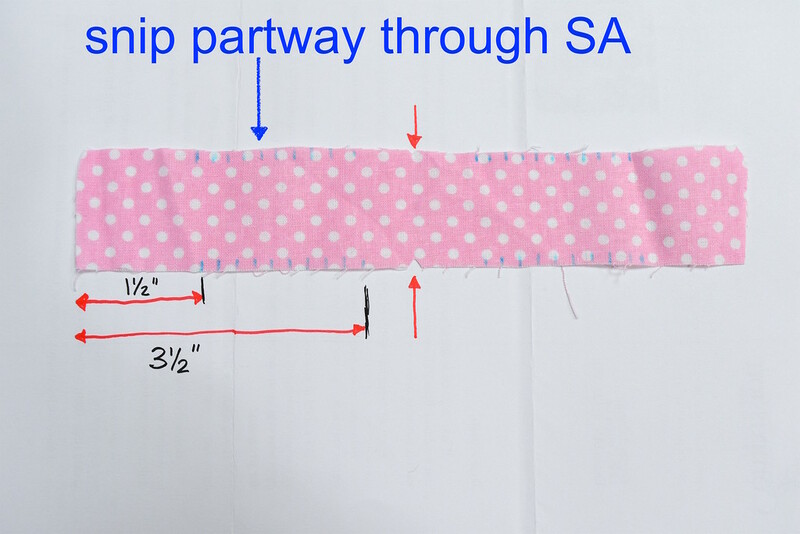 Carefully make a diagonal snip almost through the SA at each corner point A. This will allow the corners to lie flat when the bag is turned RS out. Press all seams. Turn the bag RS out through the opening you left in the seam in Stage 6. Here is that corner lying flat. 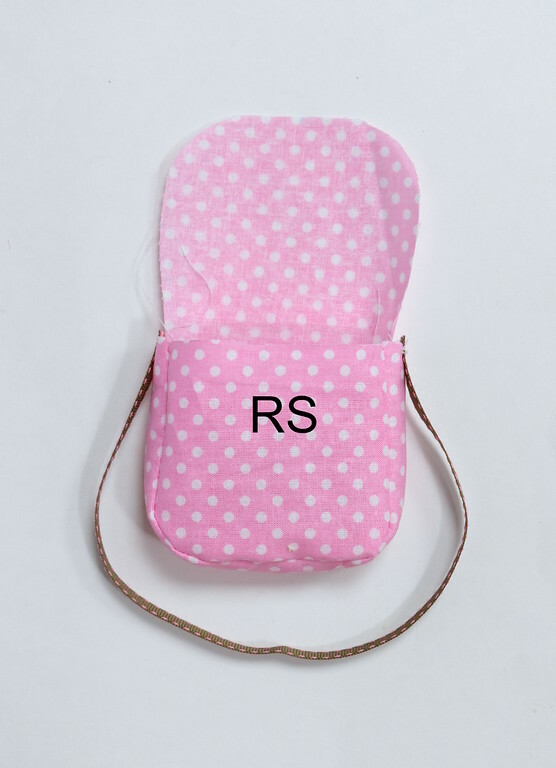 and lined with cotton, with a magnetic snap. 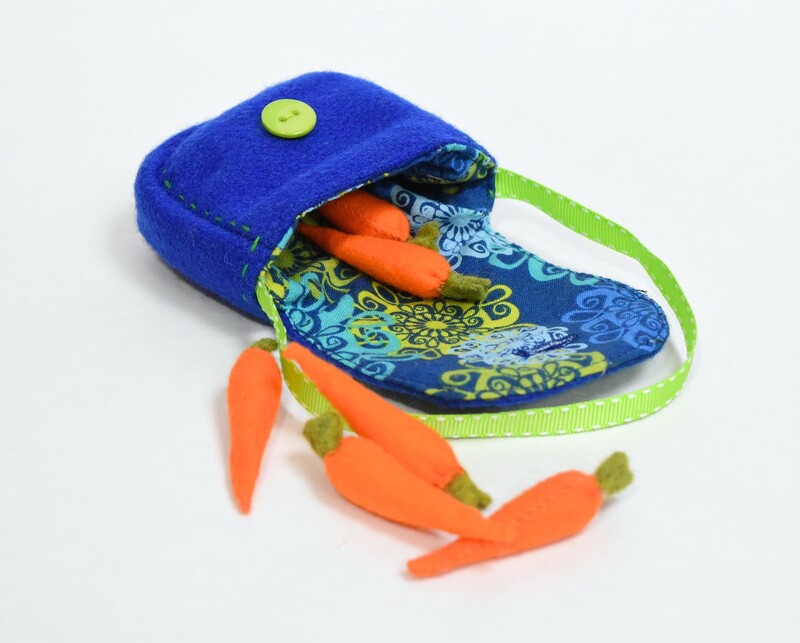 Here is the tutorial and template for the mini carrots. 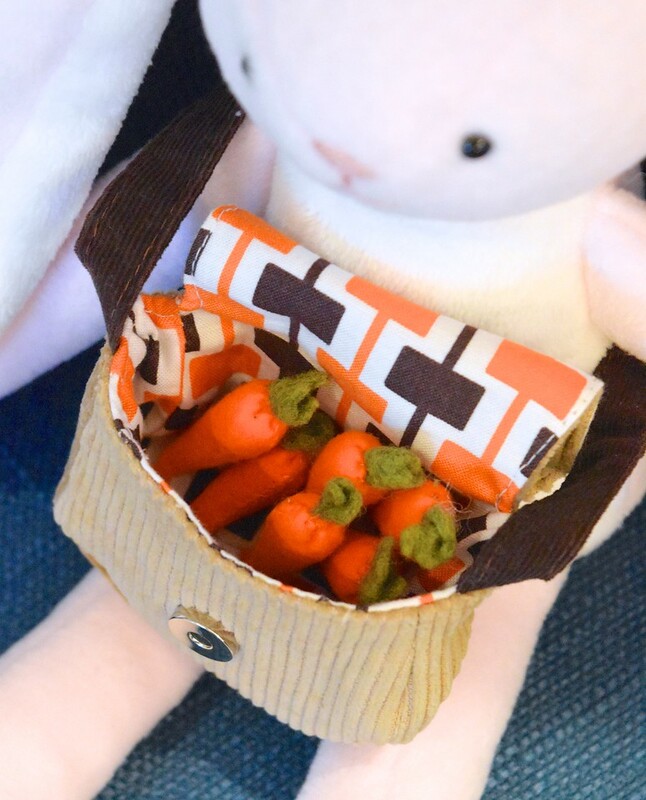 Make a bunch to fill your bag! 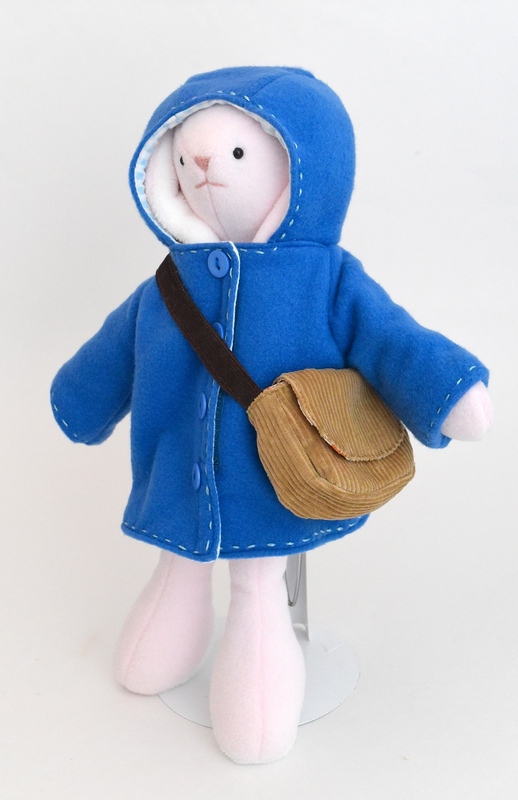 Go here for the coat tutorials Part 1 and Part 2! So cute! Thanks for sharing your ideas and tutorials! 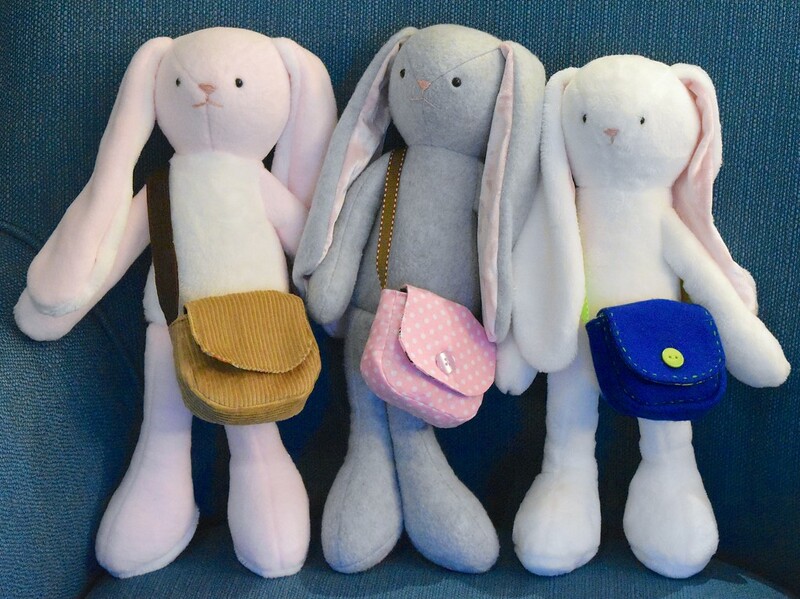 Thank you for the fun accessories for bunny. 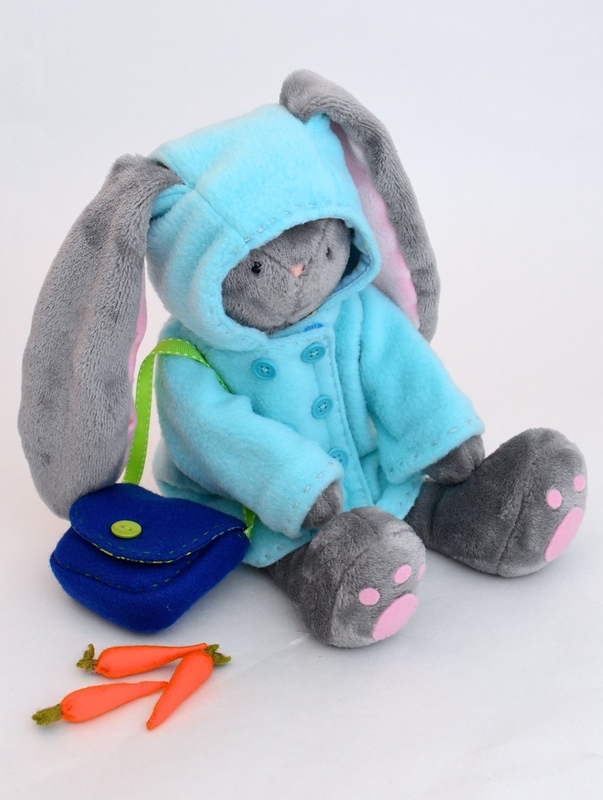 Though not much can top the fun carrot play suit! 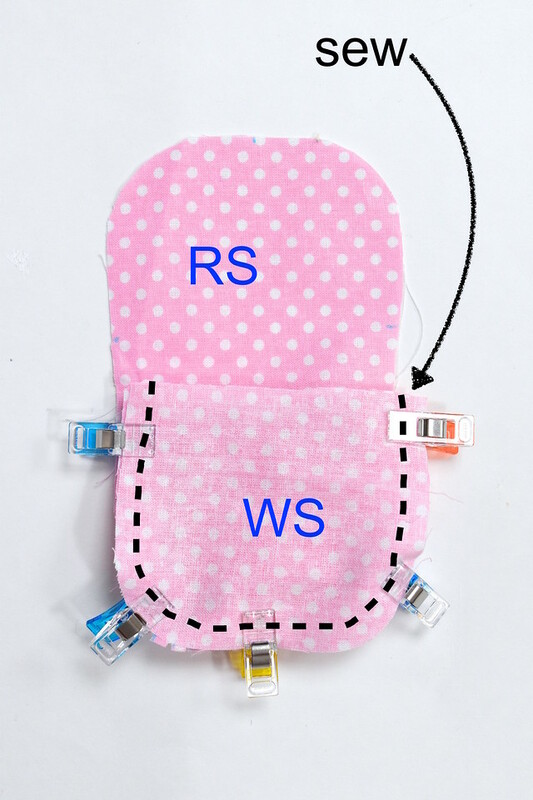 When sewing bag outsides to bag linings, why do you insert the outside into the lining, instead of the lining inside the outside? 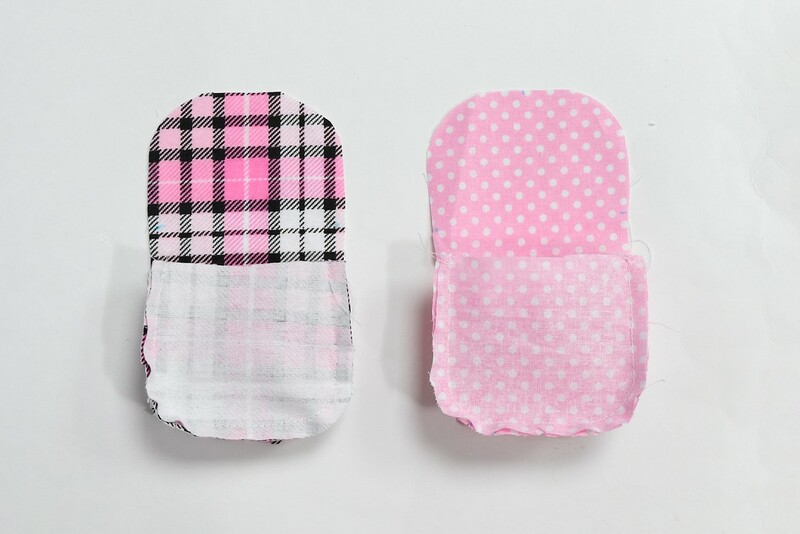 Anonymous: I don't have a particular reason - for this bag and using these two similar-thickness fabrics, the same effect is achieved if you insert the lining into the outside layer. 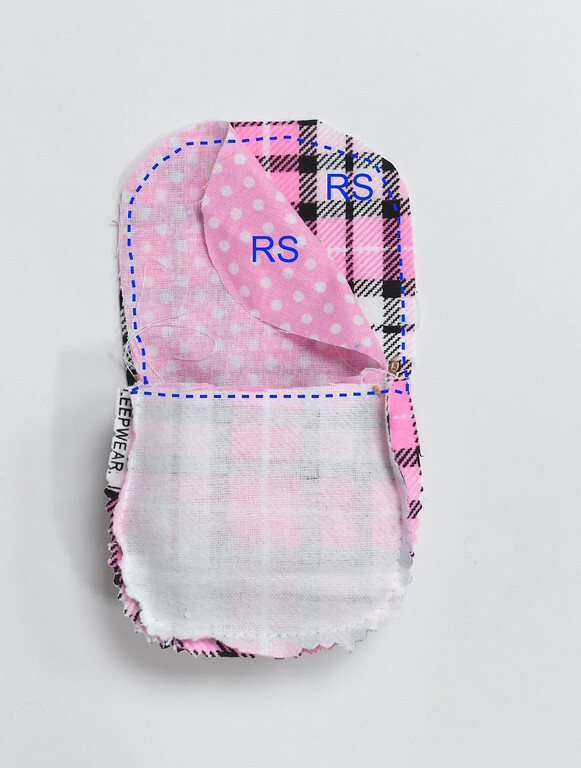 The important thing is that the RS of the two layers are together. 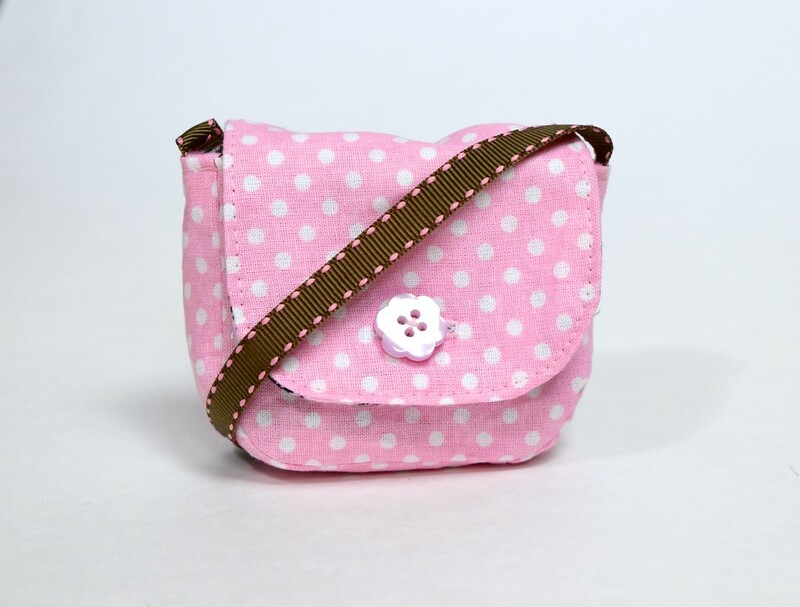 i am making one of these small bags, and it is super cute! your tutorials are clear and concise with nice close-up photos, and your site is one I check daily! (for years now) Thanks!